We may consider ourselves to be excellent communicators, having a good grasp of language, able to make our opinions clearly known but do we always mean what we say? Most people frequently use phrases which make absolutely no literal sense, in fact few conversations are ever conducted using purely literal utterances. This can create a great deal of confusion for children on the autistic spectrum who tend to take words at face value. It can be confusing too for relatives and teaching staff who may suddenly find that a bright autistic child is simply not complying with their “clear” instruction. When you were at primary school do you remember your PE lessons? Did the teacher ever say things like, “get into a circle”, “go on all fours” or “watch your feet”? Imagine that you processed language literally – what on earth would these instructions mean? How would you try and respond? It would be confusing wouldn’t it. When Edward was in year 5 his teacher told the whole class to “make a circle”. The teaching assistant observed him hesitantly raising each of his arms to shoulder height as he joined his hands together in front of him forming his own little individual circle; whilst looking really puzzled and confused. I actually think he did pretty well – he was probably wondering whether to go and get a piece of paper and a pencil and draw one. Sports are a minefield for comments that make absolutely no literal sense. This may be one of several barriers which can make sports less accessible to autistic individuals. Take football as an example; what would these phrases mean to someone who liked information to be given literally. I have my more sports enthusiastic friends to thank for the examples given above and this is only a very small selection of the ones offered. Jamie Redknapp, the football pundit once said “he is literally on fire” describing someone’s excellent performance. It’s either a humorous bit of hyperbole or a flagrant abuse of the English language depending on your point of view. Most people understood what he meant when he said it but I bet a lot of his more literally minded listeners were very irritated by his statement. Edward has never been into team sports, infact he thinks they are complete waste of his time; he has no desire to run around with other people unified in the purpose of getting a ball in a particular goal/hoop/net. 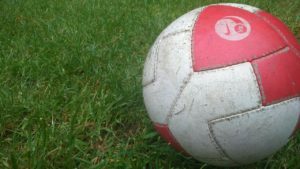 He does occasionally kick a ball around with friends if there is nothing else going on, but I have never seen him pick up a ball and ask if anyone wants a knock around. If he ever did do that, I swear I would have to conclude that he had been body snatched by an alien neurotypical football fan. All kids have to play sport at school even if they don’t do it as an extra curricular activity. It really helps kids who understand language literally to be taught all these strange sporty commands in the same way that you would teach a foreign language. It is unfair to expect them to simply pick these phrases up through exposure on the pitch, especially if they have coordination problems to battle with too. We knew that exercise was really important for Edward’s health and general fitness, especially in light of his fantastic appetite. Team sports were always going to be a problem for him, so we ended up focusing on other activities; mainly walking, swimming and trampolining. 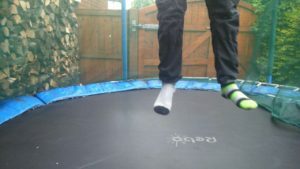 One of the best purchases we have made is our large trampoline and safety net. We’ve had the trampoline for six years now and it still gets used pretty much daily, although not by me. Other mothers will understand why and that’s all I am prepared to say on the subject! If you ever find yourself in conversation with someone who is on the autistic spectrum and you notice that they haven’t responded as you expected it’s possible that you haven’t communicated as clearly as you thought you had. My son has just been diagnosed with ASD and one of the things it’s highlighted for me is the fact that he takes everything literally. (In the real meaning of the word!) If I say it will take two minutes, he starts counting down, and its just about impossible to tease him as he doesnt see the joke. Its all new to me, so its an education in understanding! That sounds familiar! My son is 14 now and was diagnosed when he was 8, although I kind of knew long before then that he was on the autistic spectrum. I’m enjoying connecting with other parents starting out on this interesting and at times challenging parenting path, so thanks for leaving a comment. Best wishes to you and your son. We have one football story as our son has only ever played one football match! He did the warm up drills as requested at his new school but when it came to the match, the only thing he knew was that his job was to stop the other team scoring. He struggles to run & kick a ball & doesn’t understand the social nuances of football so logically came to the conclusion that if the other team were lying on the ground they wouldn’t be able to reach the ball or kick it & therefore score a goal. Consequently he implemented his football strategy by trying to push all the other players over. Obviously the teacher & players were not impressed! I’m not advocating his strategy but he did do what he was asked to do & stopped the other team from scoring! Super logic can get you in trouble can’t it! Thanks for leaving such an enlightening comment Ceri. As I write J is doing his Yr 2 maths homework. It asks him to ‘accurately’ measure lines that are on the paper. He has put some answers like 7cm 9.9mm – he said he has to be accurate!! He is now trying to draw a line 2cm long and is on his 5th attempt – I have tried to remind him there are 100 million atoms in a full stop and he will never be able to draw ‘accurately’!! But that is the instruction on his homework and it must be taken literally !! The other day his teacher told us in PE they were asked to form a line. J pushed all the children together and told them to put their arms around each other so there were no gaps – they had been told to form a line, not a dotted line with gaps between the people! Andy, thanks for your comment. Trying to help autistic kids understand how much detail is required is a challenge, isn’t it. We used the example of how to respond to the question, “How old are you?” as a way of trying to help Edward get it. You can accurately give that answer in years, or months, or days, or hours or even seconds. We asked him what kind of answer he would like if he asked someone this question and he realised then that he would like the answer in years. Hope you have enough patience to get through the homework today! I loved hearing about J’s response to “form a line” – so logical. It’s so important for staff to understand about literal interpretation of language – J’s behaviour could have been viewed as him being naughty, where in fact he was trying to be obedient and conform to the teacher’s request, even making sure that his peers conformed too. You can imagine how confusing and soul destroying it would be if an autistic child simply got told off by a teacher for these types of incidents – understanding and awareness about autism is so important. As if to emphasise the need for accuracy, J has just corrected me. Apparently there are 250 billion atoms in a full stop! I didn’t have the heart, time or energy to tell him that the number relates to the specific full stop in his science encyclopaedia (yes at 7 he is a science boff! ), and that my full stop may have more than 250B and his might have less. Anyone know an ‘accurate’ way to measure the number of atoms?! Sounds very much like my son – though now he is 15, he understands that people often do not literally say what they mean, but we often laugh about it anyway! Literal interpretation can make for some quirky moments. My youngest daughter has just reminded me that I used to ban her from singing, “I’m walking on sunshine” as it would send Edward into a frenzy of exasperation. I am lucky that my children if they don’t understand the language they will laugh at the ludicrousy rather than become confused. That’s good! Literal Interpretation can definitely lead to some funny moments at times. Thankd for your comment Clare. 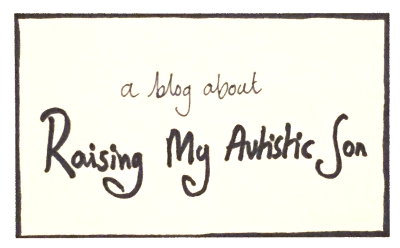 I’m linked up with #Spectrumsunday – looking forward to reading other parent posts about autism there.